We gather every Sunday to find meaning and live more deeply. Sunday service creates connections within, among, and beyond us, calling us to our better selves, calling us to live with wisdom and compassion. 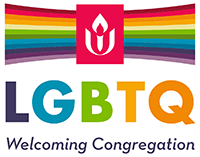 Unitarian Universalist service styles vary by congregation and even within congregations. Some congregations call their services worship, some are contemporary and high tech, others are traditional and formal. Some feature exuberant music, some include long periods of silent reflection. Our congregation’s Sunday service aims to be uplifting and inspirational, and draws from a wide selection of humanist and religious sources. From time to time, services incorporate holiday celebrations, multigenerational plays and pageants, longer musical performances, child dedications, and coming-of-age ceremonies. We offer childcare and learning programs for children and youth during the Sunday service. The Paradoxes of Unitarian Universalism by Kevin Murphy M.D.